This is a historic poem about “Greyfriars Bobby”. 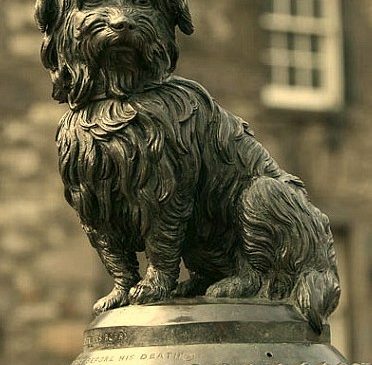 The story goes that “Bobby” was a Skye Terrier who was well known in 19th-century Edinburgh for spending 14 years guarding the grave of his master, John Gray (Old Jock), until the loyal terrier also passed away on 14 January 1872. A year later, Lady Burdett-Coutts, who was deeply affected by the story, had a statue and fountain erected at the southern end of the George IV Bridge to commemorate him. 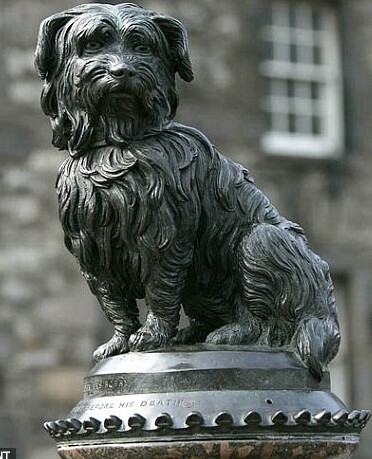 Several books and films have been based on Bobby’s life, including the novel Greyfriar’s Bobby (1912) by Eleanor Atkinson and the films Greyfriars Bobby (1961), and The Adventures of Greyfriars Bobby (2006). In 2011 Jan Bondeson at Cardiff University published research that suggests Bobby might have been a Victorian-era publicity stunt by local businesses to drum up tourist revenue. According to Bondeson’s research, Bobby was one of two look-alike stray dogs specifically trained to remain by the grave. In truth, we’ll never know – but the story touches the heart of every person who has ever loved a dog. “most faithfully . . . The background image is a photo of the actual Greyfriars Bobby statue erected in Scotland over one hundred years ago.